Espelette chillies in charcoal and sanguine. Without planning it, these experiments have turned into a series. As it is raining constantly outside, I have to dine my subjects inside. I started off with clementines(see post here) and today I grabbed the bunch of dried Espelette chillies hanging next to the stove. I started off in light vine charcoal, rubbed over slightly with my hand to erase most of the lines and then went in with the sanguine. The completed drawing. Using white conté stick, I added the last highlights/ details. 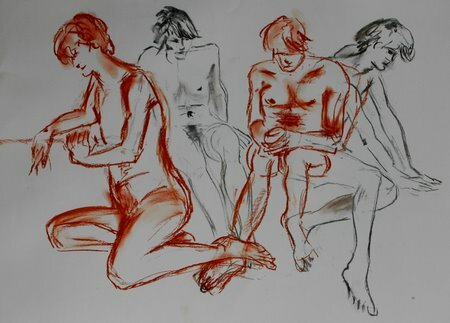 In the life drawing class a while ago, we had one long pose and used pastel pencils in black, white and sanguine. I’ve never used pastel pencils before. 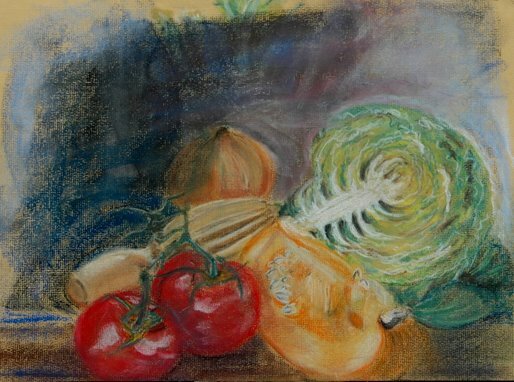 The closest I came to do something recognizable with pastels, is a little still life I did a few years ago. I dug it out to compare. It was done with soft pastel sticks. I had a hard time with these pencils. They are harder than the sticks and I kept on coloring in instead of putting in mass. Or maybe it is all the sketching and ink line work I’m doing currently and very little painting. And I didn’t want to smudge the pastel, glazing it, smooth it over. I wanted texture and expressive strokes. But it seems I’ve left her out in the sun for too long…I loved the pose, so maybe I’ll redo this later and try and come up with something more painterly and eye pleasing. Any advice from the pastellists out there? 1. We started again with our figure classes last night. 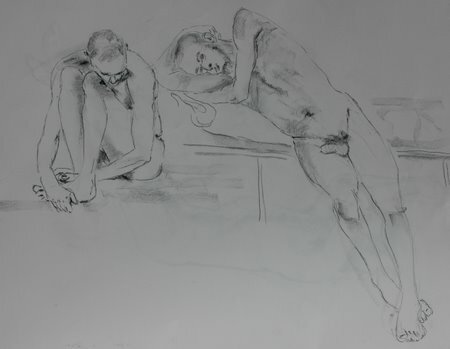 We had only one long pose and the goal was to make a “nice” drawing, with only pencil and hatching. 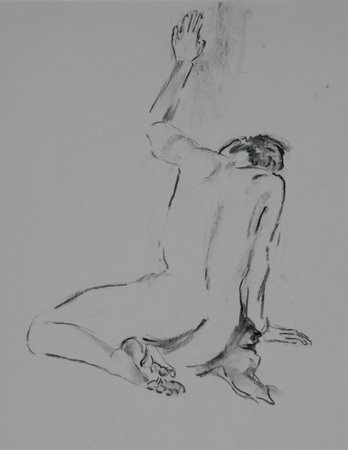 I used pencil 2B and 6B on large format paper, 42×59,4 cm (16,5×23,4″). 3. 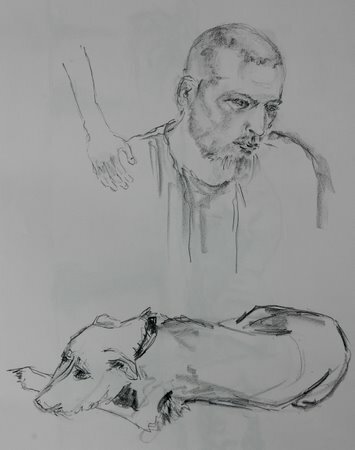 A previous class: The slim model with the dog that we’ve had on previous occasions and he lost even more weight, making it very hard to see something to draw. 5. 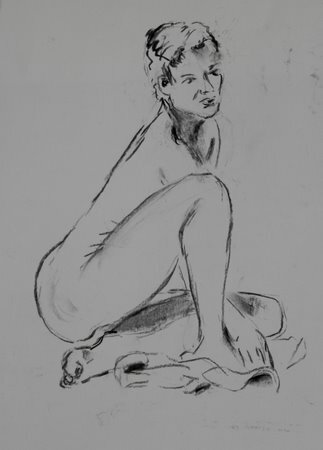 This is the same model as the first pencil drawing, but on a different occasion where we did a draining million(well almost) quick sketches for two hours. 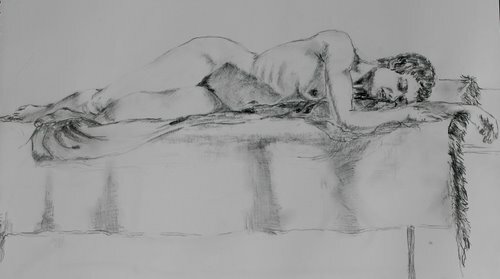 And again I consumed a whole baguette afterwards..
Charcoal on paper, large format.